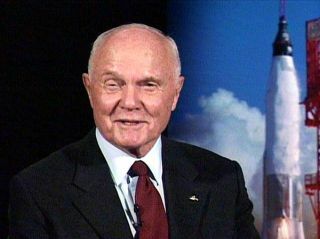 FamedMercury astronaut John Glenn, the first American to orbit the Earth, is urgingNASA to keep its space shuttles flying beyond their planned 2010 retirement tofill a gap in U.S spaceflight capability until a suitable replacement arises. In a June 17statement, Glenn said the looming years-long gap in NASA's ability to launchAmericans into space, after it completes two final shuttle missions and retiresthe fleet later this year, is cause for great concern. After thespace shuttles retire, NASA will be dependent solely on Russia's Soyuzspacecraft to reach the International Space Station until new commercialspacecraft are available in the United States. That means U.S. citizens won'tbe able to easily see their country's astronauts launch into space with theirown eyes, Glenn said. "Startingat the end of this year, and probably for the next five to ten years, thelaunches of U.S. astronauts into space will be viewed in classrooms and homesin America only through the courtesy of Russian TV," he wrote. "Forthe 'world's greatest spacefaring nation,' this is hard to accept." The commentswere released by the John Glenn School of Public Affairs at Ohio StateUniversity. NASA's new space plan, unveiled by President Barack Obamain February, has met with stiff resistance among members of Congress and othernotable astronauts, such as Neil Armstrong and Eugene Cernan ? the first andlast men to walk on the moon. Apollo astronauts Buzz Aldrin ? the second man to walkon the moon ? and? Rusty Schweickart have spoken out in favor of the new spaceplan, which would replace NASA's Constellation moon program with one aimed atsending humans to an asteroid by 2025 and then on to Mars. A gap inU.S. spaceflight ability after the shuttle retirement is consequence of boththe Constellation plan and the Obama administration replacement proposal. Thenew comments from John Glenn ? of the original seven American astronauts ? havespecial resonance. Glenn, now88, is one of NASA's first Mercury astronauts. In 1962, he became the first American in orbit when he launched into space aboardhis Friendship 7 capsule. He laterserved as an Ohio senator until 1997, then launched into space again in 1998 ?this time aboard NASA's space shuttle Discovery.? Glenn was 77 when Discoverylaunched him back into orbit, making him the oldest human ever to fly in space. In hisstatement, Glenn said NASA's three space shuttles should "stay inoperation until suitably replaced by a new and well tested heavy-liftvehicle. ""The Shuttle is probably the most complex vehicle everassembled and flies in the harshest of environments," he wrote. "Whyterminate a perfectly good system that has been made more safe and reliablethrough many years of development?" Despite theshuttles' age (Discovery ? the oldest vehicle ? has been flying into space for morethan 25 years) the orbiters are not worn out, Glenn said. "Farfrom it," he added. "Design specifications were for a minimum of 100missions per vehicle. We have used up only about one-third of that designlife." Glenn addedthat he doubted the cost savings NASA would gain from mothballing its shuttleswould have a significant impact when weighed against rising costs for access toRussian Soyuz spacecraft. NASAofficials have said that to keep the space shuttle fleet flying, it would costabout $2 billion a year. Given the agency's recent levels of funding, it wouldbe extremely difficult to simultaneously operate the expensive shuttle andbuild its replacement, experts have said. Glenn alsosaid that Obama's pledge to extend the $100 billion International Space Stationthrough 2020 ? a five-year life extension ? is the right call. The spacestation is nearly complete after almost 12 years of construction by 16different countries. Today, it is home to six people (three Russians and threeAmericans) and is nearly ready for full science operations. The spacestation, Glenn added, will be vital to understanding the physical challengesinvolved in long-duration space missions to Mars or elsewhere. That researchcould help reduce or control the ailments of the elderly on Earth, he added. Glenn alsohas no problems with NASA's new plan to forgo sending astronauts back to themoon. Returningastronauts to the lunar surface would be costly and can wait, he said. Othernecessary expenses, like developing a new heavy-lift spacecraft to replace the capabilities of thespace shuttles, should take center stage. "Wemust have a heavy-lift space launch vehicle ? whether Constellation or other ?if we are to keep our options open," Glenn wrote. With such avehicle, the United States would have a new workhorse spacecraft that should becapable of setting the stage for missions to an asteroid, Mars, back to themoon, or other deep space projects. The ability to return cargo back to Earth,Glenn added, is also important. "Aheavy-lift space workhorse to someday replace the Shuttles is a necessity forour space future," Glenn wrote. "The flexibility that gives to ourmanned and unmanned programs will be key to the world leadership as othernations develop their manned space capabilities."